You’re on Valentines Day Quotes. Romantic Valentines Day quotes might help you express your love to your Valentine. There is no day like Valentine’s Day, and it is the best occasion to express love to your spouse, girlfriend, boyfriend, or even your friends who have been there by your side for long. Whether it’s someone you are just beginning to date or someone who has been beside you for decades, this is the day to tell them how much they matter to you. The right words can rekindle an old fire or ignite a fire where there is none. If you are looking for the right message to send to your loved one, here are some famous Valentine’s quotes. Whether it is to add a little bit of spice to your relationship or show your dedication and commitment to your partner, choose the right message to make your loved one feel special! 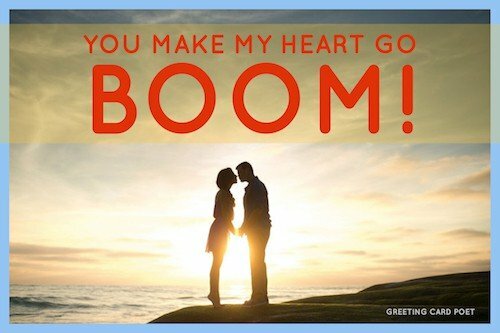 Ok, this is one of those Valentines Day quotes that might just as easily generate a groan as a smile. But, sometimes, you just have to go for it. In the right place and at the right time, it could be a home run. Swing for the fences. A quote for your valentine that is sure to get here attention. It might be better used by a guy to a gal, because it sounds like something a guy would say. A little bit like a caveman, but authentic and real. This is what our love is – a sacred pattern of unbroken unity sewn flawlessly invisible inside all other images, thoughts, smells, and sounds. Here’s a more cerebral attempt at a valentine quote by Aberjhani. Boethius lays it on the line by noting that love trumps all other laws. Here’s a really deep, romantic thought by Rabindranath Tagore. Save this one for when you’re going deep in the playbook. Edgar Allan Poe wrote this in Annabel Lee. Essentially he’s saying we’re the all-stars of love, which isn’t a bad thought to express to your sweetheart. There is no safer feeling than the comfort of sheltering from life’s storms in the harbor of friendship. There is no greater thing two friends can do for each other than simply to be each other’s friends. You should be kissed, and often, by someone who knows how. Yours are the sweetest eyes I’ve ever seen. Antoine de Saint-Exupery – Who is this guy? It’s not just about Valentines Day quotes, try out some puns. I’d like to propose a toast to us: I’m b-egging you to be my Valentine. Just don’t go bacon my heart. When kissing, you know tulips are better than one. You’ve taken a pizza my heart. It is ‘ruff’ when you are not around. You’re on Valentines Day Quotes page.